President Donald Trump has proposed a major overhaul of the federal government that would change how the government inspects the food supply and helps some of the country's most vulnerable populations pay for food. The proposal faces months of discussion and requires congressional approval before any changes could go into effect, but the White House budget director said it represents the biggest change to the federal government in almost 100 years. One of the most consequential parts of the proposal would merge the Departments of Education and Labor, but it also proposes significant changes to how the government inspects Americans' food supply and administers assistance programs, including programs that help low-income families, women, and children pay for food and housing. The White House proposal cites a government report from 2017 that have found the split responsibilities caused "inconsistent oversight" and "ineffective coordination." (William Thomas Cain/Getty Images) A side of beef is shown with the USDA inspection stamp at Wilson's Blue Ribbon Meats in Fairless Hills, Pennsylvania. 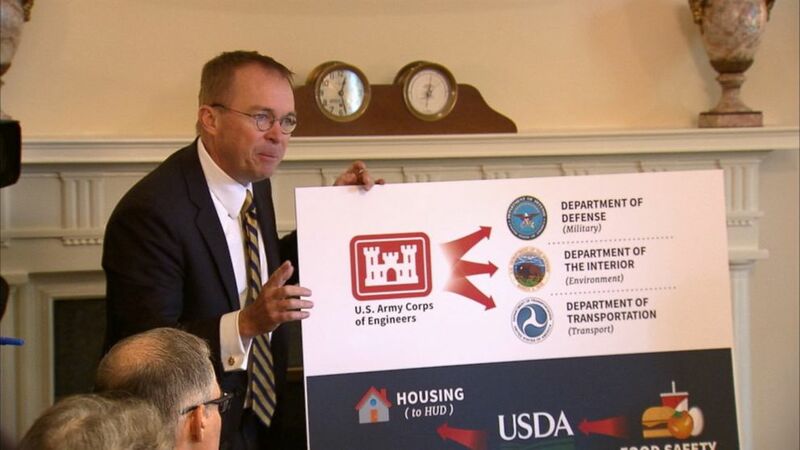 In a cabinet meeting at the White House, Office of Management and Budget Director Mick Mulvaney said the plan follows up on President Trump's campaign promise to "drain the swamp" and that current regulations are confusing. "If you make a cheese pizza it's governed by the food and drug. If you put pepperoni it's governed by USDA. If you have a chicken, governed by the USDA. If it lays an egg governed by the F.D.A. If you break the egg and make omelet USDA. Open faced roast beef it's one. Hot dog meat is governed by one. Put it in a bun governed by another one," Mulvaney said in the meeting. "One of my favorites you have a saltwater fish and salmon in the ocean it's governed by the Department of Commerce. Once it swims upriver, governed by the Department of Interior. To get there it has to go up a fish ladder governed by the U.S. Army Corps of Engineers. This is stupid it makes no sense." White House proposal suggests major changes for food inspections, food stamps. The proposal also suggests renaming the Department of Health and Human Services to "The Department of Health and Public Welfare" and giving that entity oversight of nutrition assistance programs that are currently handled by the USDA. Agriculture Secretary Sonny Perdue said the proposal should be seen as the beginning of a long conversation but that he welcomes a discussion about how to make the department more efficient. "This is not something that will happen overnight, and these ideas should be viewed as the beginning of a long conversation. We will advocate for those changes that make sense, and we will have a dialogue about areas where we feel USDA has the core competencies to most effectively deliver services," Perdue said in a statement. The White House also suggests combining similar programs in different departments under one umbrella, such as environmental cleanup programs that exist within the Environmental Protection Agency, USDA, and Interior Department. Under that proposal, the EPA would take charge of all cleanup efforts for hazardous substances, including on federal land or in abandoned mines managed by other agencies. Another federal assistance program that provides resources to improve housing options in rural areas would be moved from USDA to the Department of Housing and Urban Development under the proposal. HUD already has oversight of public housing systems around the country.